I received product for review from Cinedigm. The opinions within this post are of my own and I was not influenced in any way. Please do your own research before purchasing products or using services. Your opinions and results may differ. Discover the hero within as HERO QUEST, the inspirational animated journey headlined by an all-star cast, which arrived on Digital HD and Video On Demand March 8, and will be followed by DVD March 29, from Cinedigm. 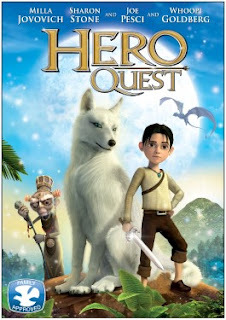 HERO QUEST follows the grand life journey of ten-year-old boy Savva (Jovovich) who is devoted to saving his mother and fellow village people after his home is taken over. Escaping into the woods, Savva befriends a majestic white wolf Angee (Chase) and together with the help of quirky forest friends Puffy (Stone) and Mosquito (Pesci), they embark on a fun-filled adventure to save the village. This colorful fairytale is all about caring for your loved ones, making true friends, growing strong and believing in a dream with all your heart. A story of heroic proportions, Hero Quest tells of a boy who goes through great lengths to save his village. He learns that he can save his people if he truly believes he can. White wolves roam the forest but don't protect the village because a magician punished them. It's up to a great knight to save the world. The boy, Savva, ends up being just that. It's up to him, a beautiful white wolf, and a handful of jungle friends to come together in battle. This is an impressive film and my nieces were engaged in watching it with me. There are quite a few humorous scenes that made us laugh. There is some very mild violence and war scenes but, ultimately, this is a movie about perseverance and honor. One person will win Hero Quest on DVD. One of my favorite wild animals is the elephant. They are so beautiful and majestic, and it is so sad they are being hunted. My favorite wild animal species would be Lions. I would have to say Bob Cats are my favorite wild animal. We see them behind our home sometimes and they are absolutely beautiful. We put a game camera out and have captured a few beautiful pis. Any animal that wont eat me is my fave. Snow leopards are a favorite of mine. Leave a comment on this blog post with one of your favorite wild animal species. My favorite wild animal is the cheetah. I love all animals but I love Lions. Chimpanzees are my favorite wild animal. Beavers because they filter water systems. I like giraffe's. My cousin loves them too. This movie looks really cute. I think my kids would really enjoy it. Thanks for the chance. I have always liked Tigers. Lions have always been my favorite. I like Siberian Tigers, panthers and Bobtail cats since they remind me of my own little guy at home. My favorite is a polar bear. My favorite wild animal is a skunk. I'm a wolf kind of girl. Or Siberian tigers. Cervils are very exotic looking. I'd have to say cheetahs are one of my favorite wild animals. i really like giraffes. they are so neat. I have always liked Tigers! Wild horses are simply majestic. As a backpacker, I both fear and respect bears. Cobras are one of my favorite species.